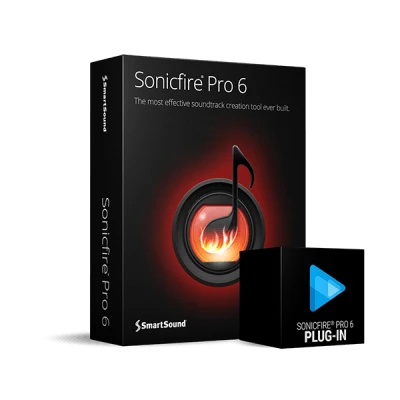 For years SmartSound and it’s flagship product, Sonicfire® Pro, have been recognized as the leader in helping media creators and editors customize music to fit their video sequences and scenes, essentially turning regular music tracks magically into perfectly scored soundtracks. While this allows you to retain the editorial integrity of your vision for your movie, there are times when it makes sense to do it the other way around - to cut your video to the music track... Now, with Sonicfire® Pro version 6, you ave the best of both worlds in one great software. Sonicfire® Pro 6's new Cut-Video-To-Music feature supports VEGAS with direct export from the Sonicfire Pro interface right into the timeline. The marker set/XML is placed right onto your timeline, giving you immediate access to start cutting. What's more, you can bring the track you want first into the Sonicfire® Pro timeline and use SmartSound's world-class features to customize the track, then invoke the new Cut-Video-To-Music feature exporting the market set or XML for your customized version of the track. This gives you the best of both worlds in one awesome feature – easily create your ideal sound, then simply cut your video to it. The exported marker set or XML of a SmartSound track becomes your guide to fast video editing that you confidently know will work with your music track. Bringing this info into your timeline lets you easily see where the music lines up with your edits, allowing you to quickly move them for a better fit. It’s an easier, faster way to work if you are cutting picture to music. It also helps when you are using Sonicfire® Pro’s Custom Length, Timing Control, Mood Mapping and other features. Make all of your customizations using SmartSounds powerful features then export the Cut-Video-To-Music marker set or XML for your finished track into your timeline. Now you can quickly pull up or back any edits that don’t quite align with the beats, bars, blocks, etc, to make an even better fit. Using Cut-Video-To-Music along with Sonicfire Pro’s other great features results in an absolutely flawless fit between your video and music.